Mr. Bhandari in his village. Achyut Ram Bhandari was born in 1959 in Gokarneshwar, a village ten kilometers from Kathmandu. He was raised in a musical family: his father and grandfather used to sing and play harmonium and tabla, and as a child he grew up singing bhajans every morning and evening with his family. Having thus been introduced to music at an early age, when he was thirteen years old he began studying tabla with Pandit Homnath Upadhyaya. Soon afterward he also joined the National Theater, an institution for the cultural education of Nepal's youth. 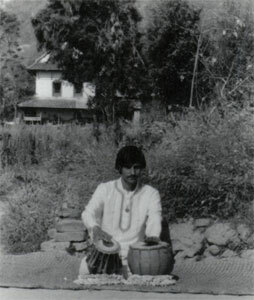 From then on he studied tabla continuously in Nepal until the age of 22. At 22 Mr. Bhandari went to Varanasi to begin studying with Pandit Chotelal Mishra. After studying for five years in India, he came back to Kathmandu and began working as a resident performer at the Royal Nepal Music Academy. There he played tabla, madhal, dholak, and dhime for classical, folk and dance performances. 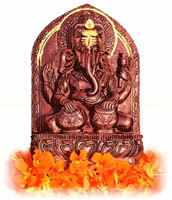 At the same time he joined Tribhuvan University as a part-time tabla teacher and began studying music at the Prayag Sangit Samiti in Allahabad, India, receiving his bachelor's degree in 1984 and his master's degree in 1990. Mr. Bhandari's first concert tour was in 1984, to West Germany, Switzerland, France, and Austria; he returned to Europe every year until 1989. Other tours in the early 1990s took him to Denmark, Hong Kong, Lhasa, and India. In 1996 he toured Nepal from end-to-end, starting from the east and making his way west. After a five-year break from touring he traveled to the U.S.A. in 2000 and 2001 with Om Shringara Nepal for tours along the east coast. Mr. Bhandari has received numerous prizes from classical music competitions, as well as recognition from the Nepali government and cultural institutions. He currently holds a permanent teaching position at the Fine Arts Campus of Tribhuvan University, and he also teaches Nepali and foreign students privately. He performs regularly for Nepal Radio and Nepal Television, as well as giving private concerts in Thamel.